So why are technologists like me so concerned? 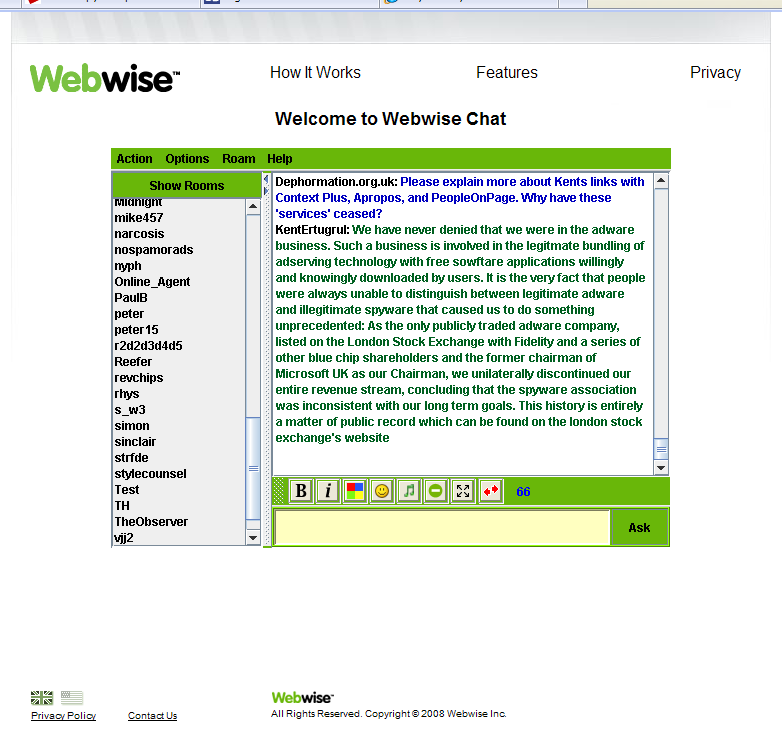 Phorm Webwise is used to intercept your Internet communications. Every request you send to the internet, every reply you receive is shared with Phorm, and used to create a marketing profile. Web traffic is communications data. Email traffic, SMS traffic, voice over IP, and even your ordinary telephone and postal communications are all ultimately just data. Phorm is the "thin end of a wedge" that will ultimately deprive us of the right to private and confidential unencrypted communication services. It will undermine the basis for private unencrypted communications, which is protected in UK and European law. Phorm have attempted to launch their product in the UK as 'Webwise', in South Korea as KT 'Qook Smartweb', Brazil as UOL/OI 'Web Navegador', Turkey as 'Gezinti.com' / 'Gozatar.com', Romania as 'MyClicknet', and China as 'MooDoo'. Typically, the impact of their technology has been chaotic, leading to protests and legal challenges. Kent Ertugrul is the CEO of Phorm. Here's what he said when we asked him about his links to adware and spyware on 6th March 2008. If you want to know why Context Plus, Apropos, and People on Page are significant, read this article from respected anti-virus firm F-Secure. Phorm are still commercially linked to the developers of the Apropos rookit, a Russian firm called OCSLab.com (Object Computing Strategies Lab, based in Moscow). Phorm also have commercial agreements with the Chinese company, Huawei. Before July 2007, Phorm traded as 121Media, and prior to November 2004 as AdIntelligence and People On Page. The systems that Phorm developed were tested illegally and in secret in 2006 and 2007 on hundreds of thousands of unsuspecting BT customers, and thousands of web sites that served them. Judges, lawyers, politicians, military personnel, police, children, and ordinary citizens were profiled in secret, using Russian supplied systems, that intercepted every web page that passed their eyes. Charity advertisements for organisations such as 'SOS Children's Villages' and Oxfam, were replaced with 'targeted ads' for Weight Watchers and credit cards. This covert surveillance occurred despite a period of critical/severe national security alert, during a period of foreign conflict in Iraq and Afganistan, and despite concurrent terrorist bomb attacks in London and Glasgow. Officials in the UK Home Office OSCT even colluded with Phorm. Organisations with responsibility for protecting national security, like GCHQ, MI5, and the CPNI took no action (despite warning of the risks of Russian and Chinese espionage before the Phorm trials). Details of the trials were revealed in an internal BT document which was leaked to the whistleblower site, Wikileaks. A petition in 2008 to the Prime Minister of the UK, Gordon Brown, was ignored. BT were permitted to conduct a third illegal trial involving 10,000 customers and the businesses that served them. Personal privacy is a human right guaranteed by Article 8 of the European Convention on Human Rights. Privacy is vital for democracy to flourish without fear. Privacy underpins freedom of speech, and the fundamental right to read and write what you like. And privacy is necessary for security. Confidentiality and integrity of communications is essential to enable commerce, including electronic commerce. Phorm is mass personal communications surveillance, nationwide industrial espionage, and intellectual property theft. Yet to date, there has been no Police investigation, no action by the Home Office, no punishment by the Information Commissioner, no action by OFCOM, and no action by Members of Parliament. In April 2011, the CPS finally announced after a two and half year delay, that it was 'not in the public interest' to prosecute the criminals involved. It later transpired that Phorm had taken the Detective leading the investigation out for lunch during the course of his purported 'investigation'. They say there is no such thing as a free lunch. And at that point, we lost our right to private/confidential telecommunications in the UK. Phorm is a corruption scandal.